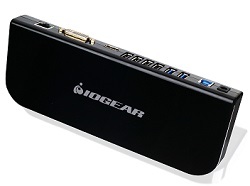 IOGEAR's USB 3.0 Universal Docking Station quickly and easily turns your laptop, Chromebook*, Ultrabook or Microsoft Surface Pro tablet into a full-featured workstation. With support for dual monitors, gigabit Ethernet, 6 USB ports, plus microphone and speaker connections, the USB 3.0 Universal Docking Station connects you to all your peripherals with just a single USB 3.0 cable. IOGEAR's USB 3.0 Docking Station delivers all the connectivity of a desktop with a simple USB 3.0 cable from your laptop, Ultrabook or Microsoft Surface Pro tabletyou've added DVI and HDMI connections supporting two additional monitors, a gigabit Ethernet port, six USB ports (two USB 3.0 and four USB 2.0), and audio input/output jacks for headsets or speakers. Now you can easily add a keyboard and mouse, external hard drives, printers, webcams, etc. to turn that laptop into a complete workstation. * - Requires separate driver installation.